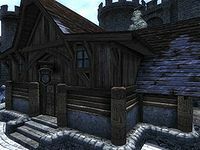 The Jerall View Inn is a fairly nice inn located in Bruma. Despite its name, it actually faces away from the Jerall Mountains. It is found on the second level of houses in the city, next to Novaroma. The publican, Hafid Hollowleg, buys potions and food while only selling the latter. The ground floor contains the main reception area, which consists of a bar, a dining room, and a fully stocked kitchen, complete with its own chef. Upstairs are Hafid's private quarters, which are locked. They contain a writing desk and an owned double bed. The rooms are in the underground floor of the inn, like most of the living quarters of Bruma's houses and stores. The room you can rent is spacious, cozy, and well-lit. It contains an upper-class double bed, a table, a writing desk, a chest of drawers, and a cupboard. In the corridor you will find some silverware and books, although taking them is considered stealing. The other two rooms, which are locked, have the same arrangement as yours; the beds, however, are not available to sleep in. Esta página foi modificada pela última vez à(s) 18h22min de 17 de dezembro de 2013.